The book begins when a self-proclaimed "prophet" dreams of an impossible lost civilisation, dreams that he claims are those of real people living on a planet in the expanse within the centre of the galaxy known as the Void. The Void is considered the biggest threat to the known universe and is constantly monitored by a large task force. It is a strange place that no-one has ever returned from and even seems to obey its own laws of gravity. It also seems to be artificially created and directed by some form of intelligence. Nigel Sheldon, the founder of the Commonwealth society and inventor of wormhole travel is asked to investigate. When Nigel jumps into the mysterious space of the Void he crash lands on a planet no-one even knew existed and he finds much more than even he expected. Bienvenido - a world populated by the descendants of Commonwealth colony ship survivors who have dissapeared hundreds of years ago. They fight a desperate battle against "The Fallers", space born creatures who seem to be artificially enchanced to conquer worlds and wipe out every species they encounter. Anyone who has read The Void trilogy will know that Hamilton has already written a great deal about this strange stretch of space. What has never been described is Nigel's journey and its a wonderful tale that manages to built on an already rich backstory. Most of the book surrounds the lives of these human castaways, reduced to a less advanced civility, one that appears corrupt and feaudal. The author makes good use of the different laws that are present in the Void, including a type of telepathy that works more effectively and plausibly than I have seen described anywhere. Then there are the alien creatures, managing to create an element of horror and levels of tension in just the right measure. The Abyss Beyond Dreams is a different book than expected, it mixes elements of science fiction with horror in a feudal environment reminsicent of many fantasy novels. It works brilliantly and I consumed the whole 600+ pages in no time at all. Although the voice is very clearly Peter Hamilton's it feels quite different to any of his I have read before, a credit to the author that he can still surprise even the most ardent of fans. 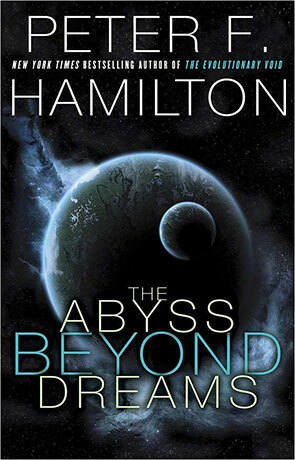 Imaginative, intelligent and accessible, The Abyss Beyond Dreams hits all the right notes. Written on 9th October 2014 by Ant.